Signs of gray leaf spot on a corn leaf. 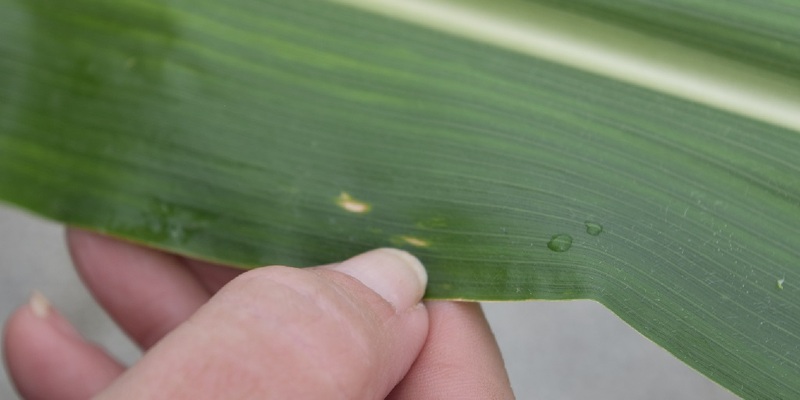 The telltale signs of gray leaf spot (GLS) and Northern corn leaf blight (NCLB) disease were visible at a recent Grow MoreTM Experience event in Columbia, MO. Summer is always prime time for disease as many, including NCLB and GLS, flourish in warm temperatures. Early signs of GLS are thin rectangular lesions along the leaf veins that combine together into longer lesions as the disease progresses. NCLB usually presents as gray or green elliptical (cigar-shaped) lesions that turn ashy gray or brown as they grow. Both diseases compromise the integrity of corn leaves, hindering corn’s ability to photosynthesize light. If left unchecked, both diseases can negatively impact yield. July 2018, Columbia, MO: Trivapro® fungicide brings Northern corn leaf blight and gray leaf spot control at our Grow More Experience site. Step 1 to combatting these diseases and preserving yield involves planting tolerant corn hybrids. Step 2 is applying a fungicide that delivers preventative and curative activity. The images above indicate the best control is achieved with an R1 application of Trivapro fungicide, the hardest-working, longest-lasting fungicide in its class for disease control and plant health. Trivapro controls many of the major corn diseases – including NCLB, GLS and Southern rust – while providing plant-health benefits – stronger stalks, healthier roots and improved water use efficiency– that promote harvest efficiency and maximize yield and ROI.